A survey of technology thinkers and stakeholders shows they believe the internet will continue to spread in a “flattening” and improving world. There are many, though, who think major problems will accompany technology advances by 2020. Technology thinkers and stakeholders assess the future social, political, and economic impact of the internet. Hundreds of internet leaders, activists, builders and commentators were asked about the effect of the internet on social, political and economic life in the year 2020. The views of the 742 respondents who completed this survey were varied; there is general agreement about how technology might evolve, but there is less agreement among these respondents about the impact of this evolution. The deployment of a global network: A majority of respondents agreed with a scenario which posited that a global, low-cost network will be thriving in 2020 and will be available to most people around the world at low cost. And they agreed that a tech-abetted “flattening” of the world will open up opportunities for success for many people who will compete globally. Still, a vocal and sizeable minority of respondents say they are unsure that the policy climate will be favorable for such internet expansion. The center of the resistance, they say, will be in the businesses anxious to preserve their current advantages and in policy circles where control over information and communication is a central value. In addition, a significant number of these dissenters argued that the world will not flatten enough to wipe away persistent social inequities. Human control over technology: Most respondents said they think humans will remain in charge of technology between now and 2020. However some fear that technological progress will eventually create machines and processes that move beyond human control. Others said they fear that the leaders who exercise control of the technology might use this power inappropriately. Transparency vs. privacy: There is a widespread expectation that people will wittingly or unwittingly disclose more about themselves, gaining some benefits in the process even as they lose some privacy. Respondents split evenly on whether the world will be a better place in 2020 due to the greater transparency of people and institutions afforded by the internet: 46% agreed that the benefits of greater transparency of organizations and individuals would outweigh the privacy costs and 49% disagreed. Luddites, technological “refuseniks,” and violence: Most respondents agreed that there will people who will remain unconnected to the network because of their economic circumstances and others who think a class of technology refuseniks will emerge by 2020. They will form their own cultural group that lives apart from “modern” society and some will commit acts of violence in protest to technology. But many respondents argue that violence arising from conflicts over religion, economics, and politics, will be more prevalent. 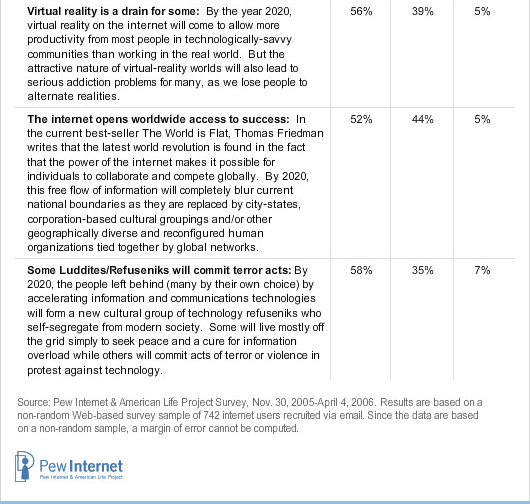 Compelling or “addictive” virtual worlds: Many respondents agreed with the notion that those who are connected online will devote more time to sophisticated, compelling, networked, synthetic worlds by 2020. While this will foster productivity and connectedness and be an advantage to many, it will lead to addiction problems for some. The word “addiction” struck some respondents as an inappropriate term for the problems they foresaw, while others thought it appropriate. The fate of language online: Many respondents said they accept the idea that English will be the world’s lingua franca for cross-cultural communications in the next few decades. But notable numbers maintained English will not overwhelm other languages and, indeed, Mandarin and other languages will expand their influence online. Most respondents stressed that linguistic diversity is good and that the internet will allow the preservation of languages and associated cultures. Others noted that all languages evolve over time and argued that the internet will abet that evolution. 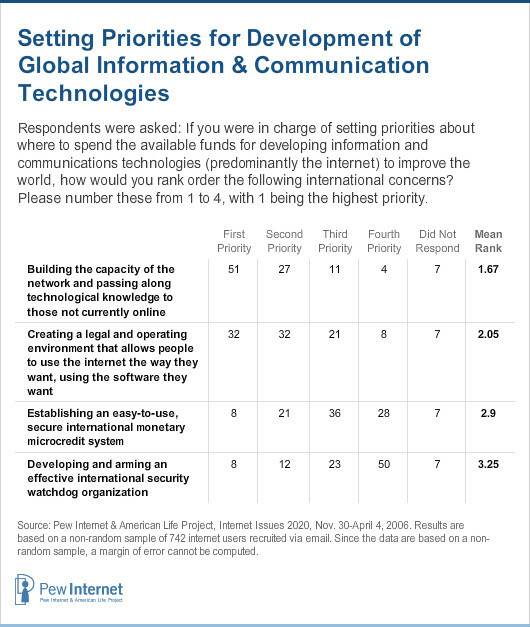 Investment priorities: Asked what their priority would be for future investments of time and money in networking, 78% of the respondents identified two goals for the world’s policy makers and the technology industry to pursue: building network capacity and spreading knowledge about technology to help people of all nations. 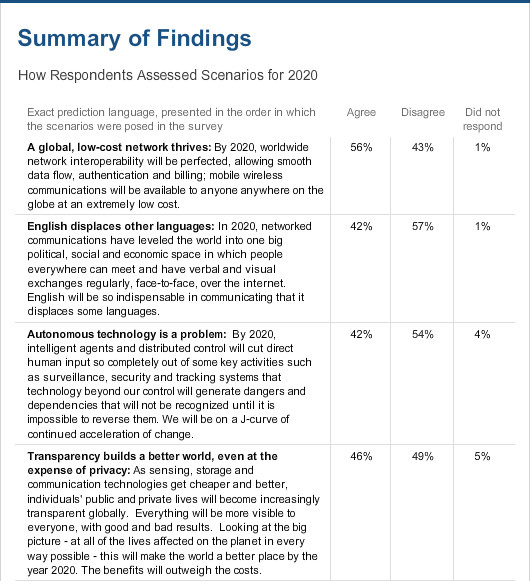 Respondents react to seven scenarios about the future. In the survey, participants were asked if they agreed or disagreed with seven scenarios about the future. They were given the opportunity to elaborate on their answers. The scenarios – woven from material collected in recent industry and research reports and predictive statements by leaders in science, technology, business and politics – were layered with overlapping elements to spur discussion and elicit nuanced views of the future. They were constructed in a way to provoke responses and conversation. They were not written to reflect the views of the Pew Internet Project or Elon University about the most likely or desirable future. Neither Pew Internet nor Elon takes positions on the policy matters or forecasts the likely impact of technological change. In many cases, respondents’ written answers indicate that they agreed with one part of the scenario and disagreed with another, so their final answer was often a qualified “agree” or “disagree” – with elaboration that sometimes reflected the respondents’ challenges to the nature of the scenario we drafted. Respondents say building network capacity and technological knowledge should be top priority. Thinking ahead to 2020: Some revealing quotations and predictions from the thousands of answers that were submitted to open-ended questions in the survey. Some words about methodology and interpreting the findings. This is the second specific canvassing of internet specialists and analysts by the Pew Internet & American Life Project.1 While a wide range of opinion from experts, organizations and interested institutions was sought, this survey should not be taken as a representative canvassing of internet experts. By design, this survey was an “opt in,” self-selecting effort. That process does not yield a random, representative sample. This survey was conducted online and is our best effort to prompt some of the leaders in the field to share their thoughts and predictions. Experts were located in two ways. First, about 200 longtime internet experts were identified in an extensive canvassing of scholarly, government, and business documents from the period 1990-1995. They were invited to respond to a survey of predictions conducted by Pew Internet and Elon in 2003 and they were encouraged to invite other experts to take the initial survey; some 304 did. Those same 304 participants were invited to take this survey and, again, invite respected colleagues join them. Second, we invited the active members of several noted internet and technology organizations to respond to the survey: The Internet Society, The World Wide Web Consortium, the Working Group on Internet Governance, ICANN, Internet2, and the Association of Internet Researchers. In the final sample, more than half of the respondents are internet pioneers who were online before 1993. Roughly one quarter of the respondents say they live and work in a nation outside of North America. While many respondents are at the pinnacle of internet leadership, some of the survey respondents are “working in the trenches” of building the Web. Most of the people in this latter segment of responders came to the survey by invitation because they are on the email list of the Pew Internet & American Life Project. They are not necessarily opinion leaders for their industries or well-known futurists, but it is striking how much their views were distributed in ways that paralleled those who are celebrated in the technology field. More detail regarding the respondents is included in the “Introduction” section of the report, and a section with extra biographical data appears at the end of this report. This report presents the views of respondents in two ways. First, we cite the aggregate views of those who responded to our survey. These answers strike us as most interesting for the fact that there is such disagreement in their views about whether the general direction of technological change will be helpful or harmful to people. Second, we have quoted many of their opinions and predictions in the body of this report, and even more of their views are available on the Elon University-Pew Internet Project website: http://www.elon.edu/predictions/. Scores more responses to each of the scenarios are cited on specific web pages devoted to each scenarios. Those urls are given in the chapters devoted to the scenarios. This report builds on the online resource Imagining the Internet: A History and Forecast. At the invitation of Lee Rainie, director of the Pew Internet & American Life Project, Elon University assistant professor Janna Quitney Anderson began a research initiative in the spring semester of 2003 to search for comments and predictions about the future impact of the internet during the time when the World Wide Web and browsers emerged, between 1990 and 1995. The idea was to replicate the fascinating work of Ithiel de Sola Pool in his 1983 book Forecasting the Telephone: A Retrospective Technology Assessment. Elon students, faculty and staff studied government documents, technology newsletters, conference proceedings, trade newsletters and the business press and gathered predictions about the future of the internet. Eventually, more than 4,000 early ’90s predictions from about 1,000 people were amassed. The early 1990s predictions are available in a searchable database online at the site Imagining the Internet: A History and Forecast and they are also the basis for a book by Anderson titled Imagining the Internet: Personalities, Predictions, Perspectives (2005, Rowman & Littlefield). The fruits of that work inspired additional research into the past and future of the internet, and the Imagining the Internet Website (http://www.elon.edu/predictions/) – now numbering about 6,000 pages – includes results from 2004 and 2006 predictions surveys, video and audio interviews showcasing experts’ predictions about the next 20 to 50 years, a children’s section, tips for teachers, a “Voices of the People” section on which anyone can post his or her prediction, and information about the recent history of communications technology. We hope the site will continue to serve as a valuable resource for researchers, policy makers, students, and the general public for decades to come. Further, we invite readers of this report to enter their own predictions at the site.